Jonathan Gates went the distance for the Sharks one last time, but it was not enough to get past the defending-champion. Up against a formidable opponent on the biggest stage, the Bolles Bulldogs showcased the grit and poise of a champion. Having won the last two Class 5A state championships, the team understood the target it carried on its back heading into Thursday’s state semifinal. Bolles proved up to the challenge, jumping ahead early and then holding the line from there for a 4-1 win over the Nature Coast Sharks, at Hammond Stadium in Fort Myers. The Bulldogs have now earned the right to join elite and special company in Florida history, with the chance to become only the fourth Florida baseball team to win three straight state championships. Bolles (24-5) will take on Monsignor Pace in Saturday’s title game, with an opportunity to join Westminster Christian, Archbishop McCarthy and the Canterbury Cougars as the only teams to ever three-peat. Meanwhile, the Sharks (26-5) are left to savor a special season that will go down as perhaps the greatest in program history. 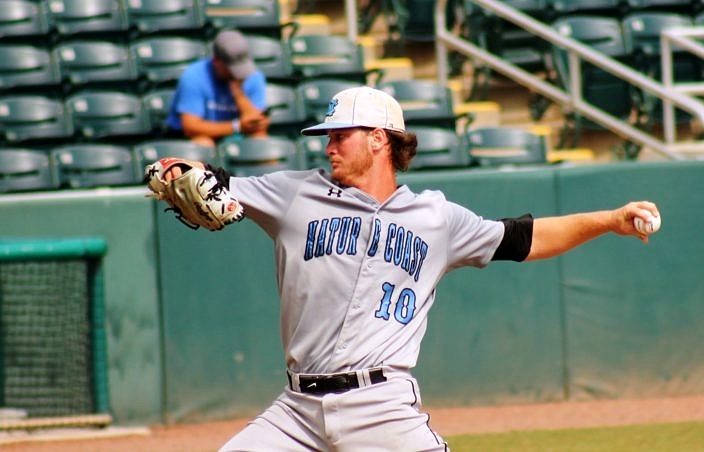 Bolles wasted no time in going right to work, as the Bulldogs jumped out for two runs off Sharks starter Jonathan Gates in the bottom of the first. Max Ferguson got it started by smacking a double into right field, and starting pitcher Hunter Barco followed by crushing a shot deep to center field for an RBI triple and Bolles’ first run. Paul Kuehn then lifted a fly ball that drifted along the right field line, where Sharks right fielder Zach Funkhouser made a nice leaping grab that unfortunately left him without enough momentum to get the throw home in time to stop the runner from tagging up and scoring. The Bulldogs went right back to work adding to their lead with their next swings in the second. Will Shepherd had a base hit to right field, stole second, advanced to third on a wild pitch and then scored on a throwing error. 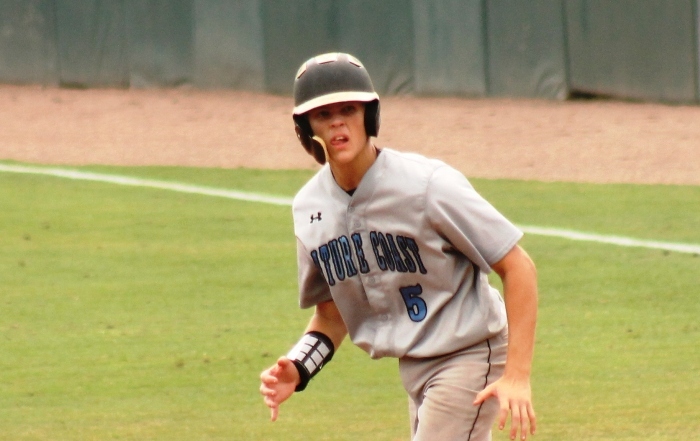 Senior Zach Funkhouser went 2-for-3 and drove in Nature Coast’s only run. Nature Coast answered back to get on the scoreboard in the top of the third. Funkhouser was hit by a pitch, stole second and then came racing around third base to score thanks to a liner into center field for an RBI single from Gates to make it a 3-1 ball game. Bolles got that run right back in the bottom half of the third. Ferguson laced a shot deep to center for a lead-off, stand-up double, and Mac Forrester dropped down a great sacrifice bunt to move the runner to third. Barco then supplied a high fly ball deep to center, leaving the defense with no hope of stopping Ferguson from tagging up and scoring on the sac-fly RBI. Even with the Sharks throwing their best punches, the Bulldogs were unflappable. Both players and coaches stayed within themselves to remain poised and in control. “We still had a great season, and there is nothing to be ashamed of,” Frank Vitale said. Playing in the state Final Four for the very first time, even the Shark players admitted afterwards that they were not prepared for the intensity they faced right away. Certainly it is a challenge to play with the emotions of such a grand moment, while stile keeping yourself grounded and treating that moment like any other game. What also did not change is the result when Barco pitches for the Bulldogs. The junior left-hander picked up his ninth win of the season while also delivering his third complete game. The southpaw recorded four strikeouts while allowing one earned run on two hits and three walks. 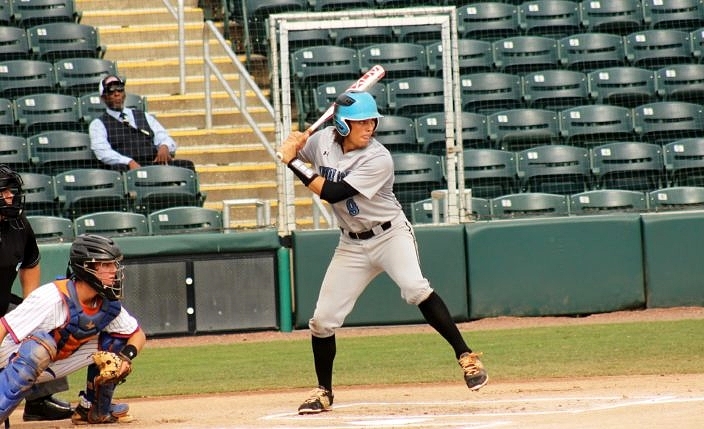 While Barco proved too tough to figure out with the outs allotted them, the Sharks were left to reflect upon a season that saw them advance further than any other Sharks team before them. None of their former classmates before them had ever even reached the regional finals, and this is a team that will be remembered at Nature Coast and across Hernando County for a long time to come. Jonathan McMath advances on the bases after drawing a walk in the fifth inning. Exiting the field for the last time after the final out was recorded and both teams had shaken hands, the Sharks’ faithful fans all stood in the stadium and loudly applauded their team one last time. Though beaten in Thursday’s action, the Nature Coast players and coaches left the field heads held high. One tough loss at the end does little to diminish a season for the ages. Leaving a legacy for future teams to look up to and strive to outshine meant a lot to the team, and most particularly to its seven departing seniors. 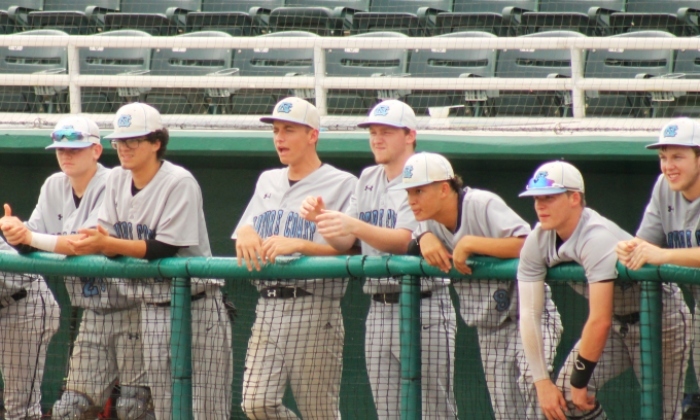 As Vitale noted, in the whole of Hernando County across every team sport, this was only the fourth time a team ever made it to the state tournament, and only the second Hernando baseball program. The small county in the middle of the state features five high schools that are often overlooked for their team athletics.